Ricky Ponting expects his reign as Australian captain to end if he is not holding the Ashes at the SCG in January. Ponting was in charge during the 2005 and 2009 defeats in England, and led his side to a 5-0 whitewash at home three years ago. 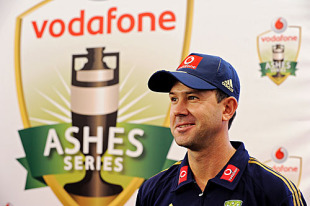 Despite being one of the game's all-time greats with the bat, Ponting knows his future depends on the result of the 2010-11 series. "I'd probably be looking for a new job if we lose again," Ponting told the Daily Mail. "It's as simple as that. I've got the biggest eight months of my career coming up." Australia face Pakistan and India in two-Test series before the Ashes begin at the Gabba in November and the series is followed by the World Cup. "It doesn't get any bigger than that and everything I do between now and April will be geared at getting the most out of myself and, most importantly, the group," he said. "If I'm able to do that I think there are some pretty special things on the horizon for this team." While the Ashes series is likely to determine what Ponting does next, he said he was not weighed down by the significance of the contest. "I haven't thought about any added pressure on me," he said. "I'm just thinking about being the best player I can be and having a significant impact on the Ashes series as a batsman and as a leader. That's all I can control. I know what it takes to be a good player in a big series and I know what it will take for the rest of the guys." England have beaten Australia in their most important encounters over the past year. The run began with their Ashes victory at The Oval and continued with a win in the World Twenty20 final and the current one-day series success. Ponting said England deserved the latest triumph but does not think they have earned bragging rights in all forms of the game. "We're still ranked the best side in one-day cricket and No. 2 in Test cricket," Ponting said. "Until England get their heads above us in all of the tables then superiority will be with us."